The family of an American woman and her Egyptian husband who were held captive for three years in Egypt are crediting President Trump for helping secure their release. Aya Hijazi and Mohamed Hassanein were part of a small group of aid workers who were locked up over allegations of child abuse and trafficking charges, even though they were in Egypt on behalf of the Beladi Foundation, a nonprofit Hijazi founded to help street children in Cairo. While the Obama administration did try to negotiate their release, it was ultimately President Trump who sealed the deal. "It's been a roller coaster of emotions the past couple of days," Hijazi's brother, Basel, told the Washington Post. "We're very grateful that President Trump personally engaged with the issue. Working closely with the Trump administration was very important for my family at this critical time. It let us be reunited as a family. We're so grateful." According to White House officials who spoke with The New York Times, Trump took an interest in Hijazi’s case after being briefed about it ahead of Egyptian President Abdel el Sisi’s visit. He then told his aides to lobby for her release with Egyptian officials. The Trump administration hosted Egyptian President Abdel Fatah Sissi at the White House earlier this month, smoothing over relations. 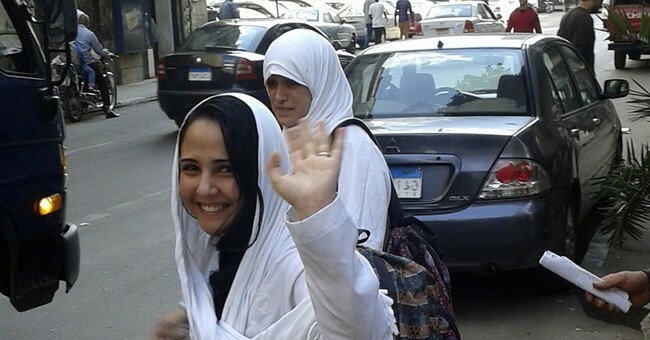 Last Sunday, a Cairo court dismissed the charges against the aid workers. Earlier this week, Defense Sec. James Mattis and deputy National Security Adviser Dina Powell visited Egypt to discuss the issue. Trump ordered a government plane to Egypt to carry the two back to the U.S.
A White House official said there was no quid pro quo offered for the releases, but they did receive assurance that the aid workers would not be called back to Egypt if they were found guilty at a later date. The couple is expected to visit Trump at the White House Friday.